Most of the time, it’s a joy to share things with our dogs — a love for hiking, walks on the beach, or quality snuggle time on the couch. Unfortunately, we share bad habits, too — It turns out our dogs are just as prone to one of our most common health problems: obesity. A few extra pounds on your pup can have serious health implications, putting your dog at risk of experiencing a wide range of diseases and conditions, including a reduced life expectancy. 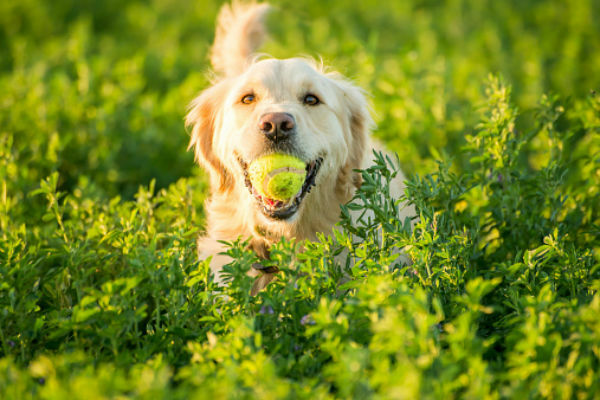 Added weight can also impact your dog’s quality of life by affecting his mobility, energy for play, and overall mood. 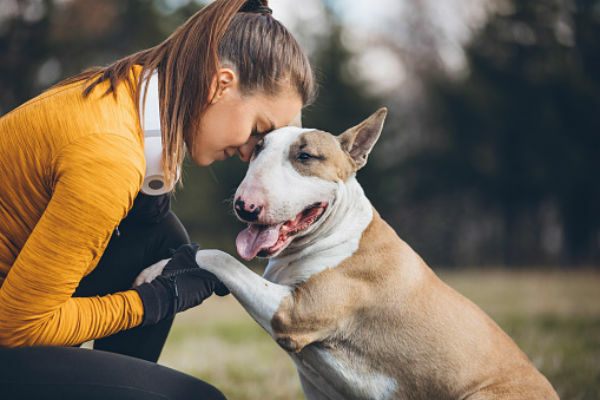 “As in humans, we now recognize obesity as the most important medical disease that affects our companion animals,” says Dr. Alex German of the University of Liverpool/Royal Canin Weight Management Clinic. Talk to your veterinarian for information and guidance when it comes to your dog’s diet and potential weight-loss plan. 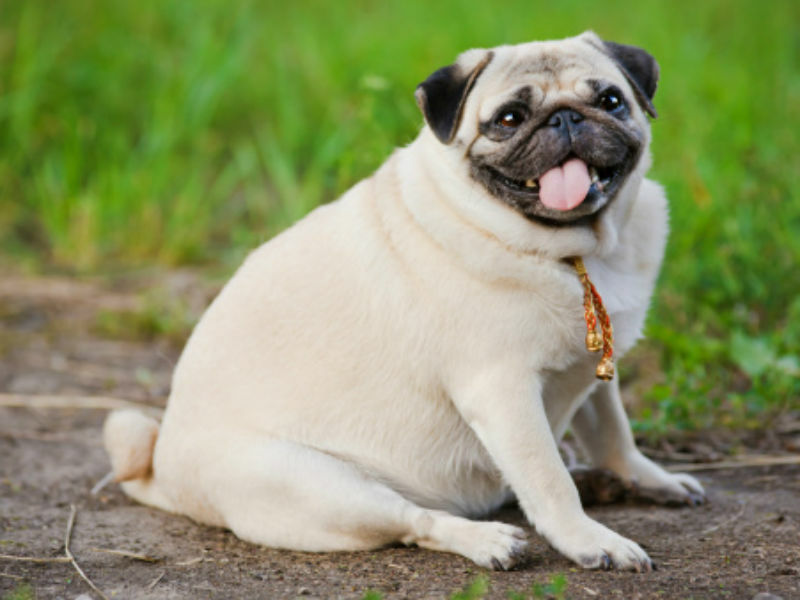 In the meantime, here are eight ways you can start to help your overweight dog. Different breeds and ages have different healthy weight ranges. Check what the AKC Breed Standard says about the ideal weight for your breed. If your dog is beyond that range, consult your vet. It’s best to get a professional’s help as you assess your pet’s accurate weight, body condition, and diet, determine if the dog would benefit from a weight-loss plan and set a target weight to work toward. Note that some dogs may be shorter or taller than their breed standard requirements, so the ideal weight would be within those dogs’ breed standard height descriptions. Just like humans, exercise is crucial when it comes to helping your overweight dog get healthy. Increasing your dog’s activity helps burn off energy (and calories consumed). Don’t panic! Exercising your pet doesn’t have to mean running marathons or going for long hikes. Regular walks and the chance to run and play in a safe off-leash environment. Even creating a stimulating indoor environment inside that gets your dog moving more often can help. Remember, different breeds need different amounts of exercise, so consult your vet, breeder, or your dog’s breed standard for guidance on how much activity is recommended. Begging is not always about wanting more to eat; it’s often a ploy to get more attention. (And, when it’s rewarded, you reinforce and encourage the behavior to continue.) If your dog begs, don’t assume that he is hungry. Trust your instincts and keep track of when the last mealtime was. If your dog is prone to begging and you’re prone to giving in to those puppy dog eyes, opt for a high-protein diet with a blend of fibers to help manage your dog’s appetite and reduce their voluntary food intake. That way you can feed your dog knowing he will feel fuller and stay satisfied longer. Even when our dogs don’t beg, many of us volunteer too many treats and table scraps. Dogs don’t need to share everything we eat! Think of treats and scraps for your pet as you would candy for children to help you keep them to a minimum. If you use treats for training, look for low-calorie, low-fat options and limit the amount. As an alternative, remember that clickers work great for reinforcement… and they’ve got zero calories! After all, a few extra pounds can make a huge difference for dogs, who are much smaller than we are. (Even those large breeds!) So, concentrate on a healthy diet, and curb the urge to “treat” them with more. Once your vet has designed a weight-management plan, you should have a clear idea of how much your dog should eat at each meal. Be vigilant; Don’t free-feed or eyeball how much you scoop out — use an appropriate measuring device to ensure you’re managing portion control. Not all weight-loss foods are created equal, so it’s important to match your dog with a nutrition plan that directly addresses their specific needs. Look for a brand that offers food ranges for your dog’s own tendencies, whether it’s weight management, food sensitivities or illnesses. Like human like pet! Studies have shown that after successfully losing weight, approximately half of all dogs regained weight. The good news is that researchers also found that rebound weight gain was significantly reduced by keeping dogs on a weight-loss diet, even after achieving their target weight. So, now that you’ve done the hard work and transitioned to a new formula that’s working, stick with it! As with so many things in our dogs’ worlds, consistency is the key. The Royal Canin Weight Care range has products for dogs of different sizes, with formulas tailored to each size’s respective nutritional needs. In large breed dogs, for example, the Royal Canin Maxi Weight Care food helps reduce your dog’s energy intake by 15 percent, using the same volume of food. An increased protein content, moderate fat content and the inclusion of L-carnitine (an amino acid that helps the body utilize fat for energy) all help your dog to achieve and maintain an ideal weight. And Royal Canin’s Satiety Support range is a great option for dogs that are prone to begging. Studies have shown that dogs can lose weight faster when eating this food, while still maintaining muscle mass. Ask your vet about Royal Canin’s range of veterinary diet dog foods designed to help dogs with obesity and satiety support.